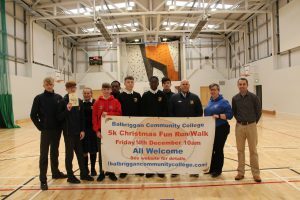 Balbriggan Community College will host its annual Christmas 5k Frosty Fun Run/Walk on Friday 14th December 2018 at 10am. The event is being organised by the school to raise vital funds for extracurricular activities. Our students received their sponsorship cards on Friday and don’t forget the Frosty Fun Run is again, open to the public, so we would like to invites parents, brothers, sisters, family relations, past students, budding athletes and anybody who just wants to have some fun to please register for the event and help raise as much money as possible. The entry fee is €10.